This beautiful large sailboats art is made with wood on wood. The wood has all the cracks, nail holes and imperfections of reclaimed wood. 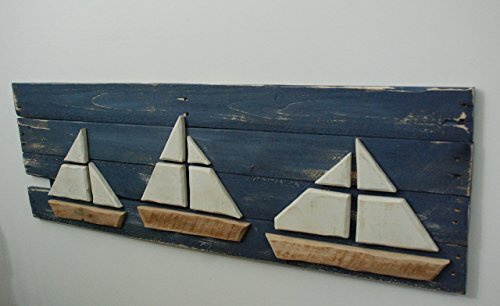 Perfect for any beach, coastal or nautical decor. We have one like this hanging in our house and everyone who comes through the door comments on it. Hardware attached for hanging if desired. If you have something in mind for a custom order, please do not hesitate to contact me. We would be happy to help create what you are looking for!